Reflecting back on the last 4 yearsin realizing Prime Minister Narendra Modi’s dream for India to emerge as the human resource capital of the world as China became a global hub for manufacturing,‘Skill India’,launched in July 2015, emphasizes on industry and technology linkages and is an integral part of the NDA government’s war against povertyand unemployment. These were 4 valuable years of utmost dedication and hard work in terms of putting together proper governance structures and streamlining program implementation through the newly formed Ministry of Skill Development and Entrepreneurship. Integrity and efficiency in procurement : Sanction of proposals compliant with GFR (General Finance Rules) and higher levels of transparency and efficiency. During UPA I & II, sanctioning of skill development projects were not systematic and was found to be lacking in a very large measure on transparency. Effective monitoring : Stringent monitoring of attendance and trainings through an Aadhaar-back biometric attendance system and periodic reviews of in-class CCTV recordings. During UPA I & II, fake enrollments were the standard norm. It was common practice to report large number of candidates as trained and provided employment when in reality no such training or jobs were provided. Labour market alignment : Trade prioritization to focus on jobs that make a real difference to the economy, business and the youth. The UPA governments approach was to churn out of large unverified numbers resulting in gross financial misappropriation and least possible levels of job creation. Actual trainings if any were predominantly in the unskilled category where no such training intervention is required in the first place. Standardization : Prudent implementation of Common Norms (CNN) to streamline different skill development programs. During the UPA I & II years the lack of coordination between ministries and the center and state eventually lead to administrative failures. More time was being spent on resolving internal matters than delivering a public good. With CNN in place and periodically revised to keep it responsive to market changes the focus is back on development. Independent, third party certification : During UPA I & II, program implementing agencies (PIAs) of SGSY—SP and other skill development programs could literally appointed their own assessment & certifying agencies or none at all and, in some cases, these were their own subsidiaries despite the third-party assessment clause. Therefore, post training assessments were not conducted. This was the weakest link that attributed to gross administrative failure. The assessment process is now formalized by proper assessment process streamlining and robust monitoring of the genuine third-party assessments. Candidates trained under ‘Skill India’ are now assured of recognized government certifications that are widely accepted by industry. Process improvement : Robust systems and processes have since been introduced to ensure superior program deliverables. The objective of the UPA I & II was focus on churning out and reporting large number often through fraudulent practices that largely went unchecked. Result-oriented : The BJP-led NDA government’s top priority is policies and program that really work for the people and the economy. During UPA I &II, the single- point agenda was report large unverifiable numbers despite these not resulting in job creation or economy benefit. Meaningful program components : Well-regulated recognition of prior learning (RPL). During UPA I & II, NSDC partners were encouraged and rewarded to enroll existing employees and college students in large numbers under the Star scheme often through questionable means. This fraudulent practice has since been eradicated. Verifiable outcomes : Placements are verified by actual salary credited in candidates’ bank accounts with salary slips and a mandatory 12—month tracking of the candidate post training. During UPA I & II, the absence of proper monitoring and reporting system allowed the NSDC and other skilldevelopment programs to freely report large unverified numbers candidates employed. Good governance : The creation of a new skill development cadre in civil service in addition to the separate central ministry for skill development led by a cabinet rank minister and a minister for state brings the focus back on the importance of good governance to ensure India’s youth have the right talent and skills to help them succeed in a rapidly changing world and industry can access a highly skilled workforce. During UPA I & II, an Office of the Advisor to the Prime Minister on Skill Development & NSDA were set up. Outcome? Inability to effectively coordinate between Ministries and state governments. Scale/Score: 5 is highest and 0 is least. 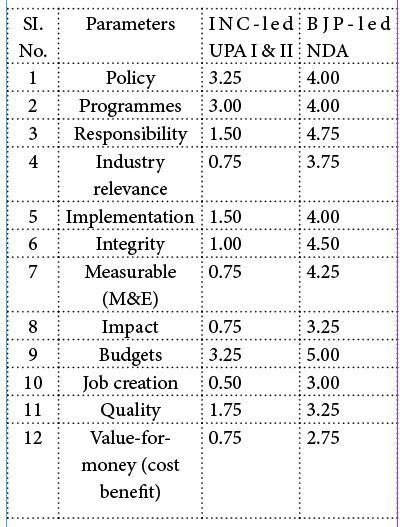 PolicyMatters’ rating. BJP-led NDA’s rating is expected to increasesignificantly by 2020 when the impact of its current policies and well-administered programmes become fully profound. When in opposition, P Chidambaram and the Congress Party emphasis on the need for job creation initiatives to focus on aspirational regular wage employment. The UPA’s February 2009 National Policy on Skills Development set itself a target to train 500 million by 2022. From 2009 – 2022, over a period of 13 years with 12 million people joining the India’s workforce every year, jobs need to be created for 156 million. As 7% of the workforce constitutes organized sector workers only 10.92 million are by Congress Party’s standards qualified as relevant jobs. Notwithstanding, only 10% of workers in the organized sector receive any formal training, why would the Congress Party set itself a target of 500 million to be trained against a demand of 1.1 million. The UPA’s very own RPL initiatives and direct assessment (MES, SDIS) were exclusively to assess, train and certify unorganized sector workers representing micro entrepreneurs and blue-collar workers that employs 93% of the Indian workforce. Furthermore, SGSY-SP, SJSRY, Modular Employable Scheme, NSDC and other centrally sponsored skill development schemes (CSS) that were to train 500 million by 2022 were short-term, non-formal training for an unskilled or semi-skilled minimum wage jobs market. Therefore, it is evident the Congress suffered from a severe case of policy paralysis as far as skill development is concerned. This paralysis was the root cause of any administrative or programmatic failures. Make a clear distinction between skilling and market insertion programmes on the basis of a sound trade-wise cost–benefit analysis. Prioritize highly skilled and skilled trades over unskilled and semi-skilled trades as ‘Skill India’ will succeed on the premise of – more economic relevance and less arbitrary numbers. Publicly-funded skilling initiatives linked to actual job opportunities and not irrational numbers churned out of speculative if not faulty skill gap analysis. Self–employment trades: Identify and categorize only those trades that have ‘real’ self-employment potential and facilitate convergence with credit linkage and capacity building programmes such as Mudra Yojana, SJSRY, NIESBUD and RSETI. A skill voucher program to foster market driven model on the principles of a free market. Only the right policies and program structures can support such an initiative. A regulatory body to monitor risk / exposure of public funds to individual training companies by initiating a rating system. A ‘functional’ NSQF that supports career progression and qualification advancements in a practical and meaningful manner. The Recognition of Prior Learning (RPL) component is applicable only for those select trades with strong labour market rationale for such an intervention. Reform NSDC by (i) including financing skill development projects to RBI’s priority sector lending list, (ii) PMKK and PMKVY implemented directly by State Skill Missions as a centrally sponsored scheme (iii) Sector Skill Councils (SSCs) self-governed and operated by industry but regulated by NSDA and (iv) Other functions of NSDC taken over directly by the Ministry. Assessments, certifications, curriculum, and trades (QP/NOS) undertaken by a single entity rather than two separate entities – MES (SDIS) and SSCs to avoid duplication. When launching ‘Skill India’ Prime Minister NarendraModi said “We need to have futuristic vision and prepare plans for the next 10 years. We have to create structures and mechanisms to nurture youngsters, enabling them to find employment”. The last 4 years has witnessed progressive policy making towards structural reforms and effective program implementation guided by a futuristic visionary who dares to dream big for India.